NATO ends its military operation in Libya at midnight on Monday, seven months after launching an air and sea campaign that helped bring the overthrow and death of Muammar Gaddafi. Palestinians won a crucial vote to enter UNESCO as a full member today, scoring a symbolic victory in their battle for statehood and full membership in the UN General Assembly. Kyrgyzstan’s moderate Prime Minister emerged today as the next President of the violence-scarred nation after a decisive election victory, but his vanquished rivals claimed the ballot was rigged. Suicide attackers today blew up a truck bomb and raided UN and US charity offices in Kandahar city, killing five Afghans in the latest major attack on American interests in Afghanistan. A Tunisian court has issued an international arrest warrant against the widow of the late Palestinian leader Yasser Arafat over alleged corruption, a justice official said today. Hindus celebrated Diwali at a historical 160-year-old temple at Peshawar in northwest Pakistan after it was reopened to the minority community after six decades on court’s orders. In announcing the decision last week, NATO Secretary-General Anders Fogh Rasmussen called it "one of the most successful" operations in the history of the 62-year-old alliance. The NATO chief made a surprise visit to Tripoli today, saying he foresaw no major role left for the alliance in Libya hours before its air mission was due to end officially. His visit comes seven months after Western powers fired the first barrage of missiles against Gaddafi forces in an air war that played a major role in ousting the veteran dictator. The no-fly zone and naval blockade, enforced by NATO since March 31, will end at midnight on Monday, as stipulated by a UN Security Council resolution last week that closed the mandate authorising military action. Rasmussen told AFP that he would hold talks in Tripoli with National Transitional Council (NTC) leaders, including chairman Mustafa Abdel Jalil, "about their expectations as regards Libya's future and in particular their roadmap for transition to democracy." The other major theme he would raise with Libya's new leaders, he said, "will be their expectations as regards possible NATO assistance in the future." "Tonight at midnight Operation Unified Protector will end. But we have also clearly stated that if the new political leadership in Libya so requests, NATO stands ready to help them in their transformation to a democracy," Rasmussen said. For instance, he said, NATO could help could be given "when it comes to defence and security reform." "(But with) no NATO troops on the ground, I don't foresee a major NATO role. It's now for the United Nations to take the lead of the international assistance to the new authorities in Libya," the NATO secretary general said. NATO chief Anders Fogh Rasmussen ruled out the possibility of a no-fly zone over Syria, in remarks to an AFP correspondent as he travelled on Monday to Tripoli to mark the end of the alliance's air war in Libya. "It's totally ruled out. We have no intention whatsoever to intervene in Syria," Rasmussen said when asked if there was a possibility NATO would now spearhead a no-fly zone in Syria. "We have no intention whatsoever to intervene in Syria," he insisted, saying the conditions there were different to those in Libya. "The general assembly decides to admit Palestine as a member of UNESCO," said the resolution that was adopted to loud applause by 107 countries, with 14 voting against and 52 abstaining. 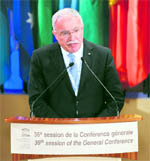 Palestinian foreign minister Riyad al-Malki, who was at UNESCO's Paris headquarters for the vote, hailed "a historic moment that gives Palestine back some of its rights," while Israel said the move damaged hopes for peace. "This is a unilateral Palestinian manoeuvre which will bring no change on the ground but further removes the possibility for a peace agreement," the Israeli foreign ministry said in a statement. France, which had voiced serious doubts about the motion, approved it along with almost all Arab, African, Latin American and Asian nations, including China and India. Israel, the United States, Canada, Australia and Germany voted against, while Japan and Britain abstained. The United States and Israel are set now to withdraw their funding from the UN cultural body, while other UN agencies may have to debate the thorny issue. Washington has slammed the move as counterproductive and premature, while Israel's ambassador Nimrod Barkan admitted before the vote that he was resigned to the Palestinians gaining entry. Staunch Israel ally the United States in the 1990s banned the financing of any United Nations Organisation that accepts Palestine as a full member, meaning the body would lose $70 million, or 22 per cent of its annual budget. Almazbek Atambayev, a close ally of outgoing President Roza Otunbayeva who took power after a 2010 uprising ousted the regime of Kurmanbek Bakiyev, won 63 per cent of the vote in yesterday’s polls, the central election commission said. The crushing victory over his two nationalist rivals, who garnered less than 15 per cent apiece, gave Atambayev the presidency without the need for a potentially tricky second round. The bombers struck outside a compound housing offices of the UN and US-based International Relief and Development (IRD) in Kandahar, as Turkey gears up to host a major conference designed to quicken efforts to end the 10-year war. The bombing came two days after 17 people died in the deadliest attack yet in Kabul against the US-led NATO mission, including 10 Americans, and three days after a US-run base in Kandahar was targeted. One attacker detonated the vehicle outside the buildings, killing one unarmed watchman, before three others entered the joint compound, shooting dead three other guards, said provincial police chief Abdul Raziq. He said the attackers holed themselves up in a veterinary clinic and fired on security forces, also killing a local district police chief before they were themselves shot dead after more than six hours. Taliban spokesman Yousuf Ahmadi said the insurgent group carried out a car bomb attack in Kandahar-the Taliban’s former capital-claiming the UN refugee agency was the target. Scores of Hindus, including women and children, visited the Goraknath temple at Gor Khatri, which was reopened after Phool Wati, the daughter of the shrine’s cleric, petitioned the Peshawar High Court. Phool Wati and her son Kaka Ram have claimed that the temple, which has been controlled in past decades by the police, the Evacuee Property Trust Board and the provincial archaeology department, belongs to their family.